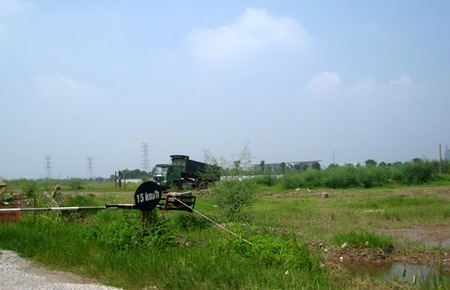 Once advertised as the biggest real estate project in the southern part of Hanoi, Gamuda City, a new urban area expected to be located in Hoang Mai district, remains a vast weed filled deserted land. In December 2009, Gamuda Land Vietnam, belonging to Malaysian Gamuda Berhard Group, officially received the license to implement the project on Yen So Park – one of the two projects undertaken by the company under the mode “exchanging land for infrastructure.” The component project would be a part of the mammoth project on developing a new urban area, a miniature new city, next to the park. Expected to cover an area of 200 hectares, Gamuda City is believed to be developed into a big urban area with international stature in Hanoi, with two residential quarters, amusement park areas and one high grade shopping mall. Therefore, the information that a lot of investors, who injected money in the project, have been offering to sell their contributed capital in the projects with preferential conditions, has surprised many people. An investor said he tries to bargain his contributed capital to escape from the project, which is expected to last nearly 10 years. He said that residential quarters would be ready in many more years, during which a lot of problems may arise. It would also be difficult to sell the apartments here, because clients now are interested only in the projects to be completed soon, while they would turn back to the products which remain on paper. Another source said that investors have recently got started when hearing the information that Gamuda City is situated on the weakest geological area of Hanoi which is in the high danger of depression. This has prompted investors to run away from the project, even though the investor, after carrying out the field work, came to the conclusion that high rise buildings can be set up here. Cheong Ho Kuan, General Director of Gamuda Land Vietnam, said the total investment capital of the project is over five billion dollars. To date, the company has disbursed 200 million dollars, mostly for the implementation of the two component projects – the park and the waste water treatment plant. Meanwhile, the capital disbursed for the residential quarters in the project remains modest. The investor still has not finished the site clearance work, mostly because the local landlords refused the low compensation levels suggested by the investor. Meanwhile, the investor affirmed that the compensation levels were approved by the Hoang Mai district’s authorities. Even though the site clearance work is yet to be completed, the investor still has put the accommodation items on sale, which is a violation of the Real Estate Business Law. In the open letter to investors, the real estate project developer wrote that Gamuda City would turn the southern entrance gate to the city into one of the most bustling commercial hub with two modern residential quarters, and modern shopping malls which would help stimulate investments. The project developer emphasized that no other urban area in Hanoi is situated on such advantageous position like Gamuda City in the southern part of the capital city, at the entrance gate to the city, which faces important areas of the city. However, the dreamful city just remains on paper, while the land plot for the construction site, remains a vast deserted land. When asked about that, General Director of Gamuda Vietnam said the project developer has the long term vision of 5-10 years when developing the project. “The temporary difficulties of the property market will not be able to strike Gamuda down,” he stated. However, people still have doubts about the statement, especially when Gamuda Land has terminated the contract on advertising for the project with a media company because of financial problem.